While we’re not quite ready to say goodbye to those kids’ sandals, these Bobux Desert Boots are helping us out. Easy to pull on, they’re made from leather, making them breathable and simple to clean. Adjustable, they can be worn with thinner socks in the autumn, then teamed with woolly socks when it gets colder. As you can buy a pair for each stage they make a great pick for siblings who like to match. And it’ll save on the arguments too! #twinningiswinning. When the weather’s muggy and rainy but you’re not quite ready for winter coats, the Gosoaky Unisex Cape will become your go-to piece. Lightweight, it features slits for hands, and a peaked hood that keeps rain away. What more could you want? Want something a lil’ bit more traditional to keep kids dry and cool? 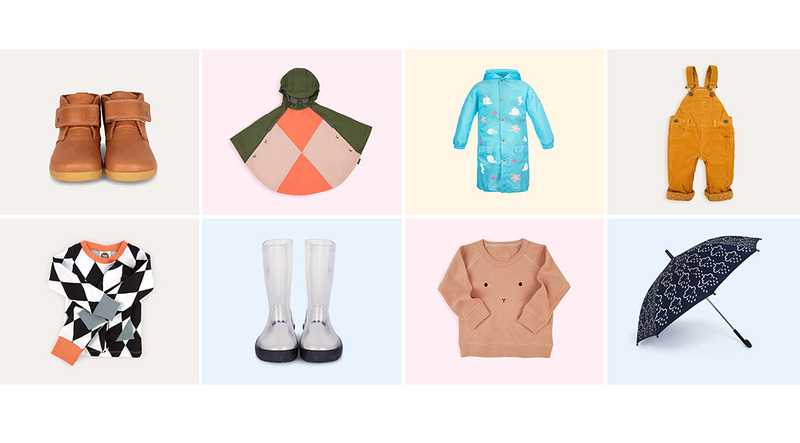 This Squid Kids Long Rain Jacket is what you need in your life. Warm enough for autumn climes without being bulky, it’s waterproof and, more importantly changes colour when it gets wet. With this fun element, they’ll be begging to go out in the rain! Nothing says autumn more than a pair of dungarees and we’re all 😍 over these Dotty Dungarees Corduroy Dungarees. They’ve been made to last for up to a year, thanks to clever folding hems and adjustable shoulder straps, meaning they’ll last into winter and beyond! We love how these can be paired with the KIDLY Label Long Sleeve Pocket Tee for a stylish warm autumn feel. Gone are the nights when it was warm enough for our kids to sleep in a nappy, pants or in shorts and tees. That’s right, it’s time to roll out the longer sleeved PJs. We’re currently crushing over these Bright Company Slim Jyms Pyjamas. Made of breathable cotton, so kids don’t get too hot, and in a slim fit to keep them comfy, they’re a dream pair. Let’s be honest. In this country, we pretty much need a pair of wellies all year round. But as the seasons change, they become more of a necessity. Currently on our wishlist are these Igor Splash Nautical Wellies. As well as a non-slip sole and removable inner for ease of cleaning, they’re an awesome see-through style. Make a style feature by adding cool socks underneath them for the pre-school world to see! With the weather not really knowing what it wants to do over autumn, we’re often stuck with what to dress them in. The answer? A sweater of course. And this Organic Zoo Bunny Sweatshirt is just the autumnal ticket. Made from organic cotton so it’s breathable, it makes a great layering piece. Oh, and it also looks great teamed with our KIDLY Label Leggings #justsaying. They’ll be begging for rain thanks to this Grass and Air Colour Changing Umbrella. Designed to encourage kids out in the rain, it’s made from an innovative technology that makes the raindrop pattern change from white to multi-coloured as water hits the fabric. Easy to open and the right size for kids, it’s a winner!